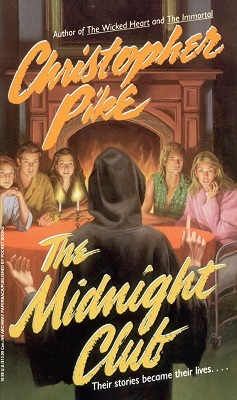 The Midnight Club is not really a horror story at all. Not in the traditional sense anyway, but neither is it a light-hearted read because all the central characters are dying. There are no more treatments for them to try, no miracle cures are imminent, and all hope is gone; so it is quite a sad tale. The story is set in Rotterham Home, a hospice where all the residents are terminally ill teenagers. The main character is a girl called Ilonka Pawluk. She has cancer, but for much of the book she remains in denial about the severity of her condition. She has been taking a mixture of herbs and is working very hard to convince herself that they are working. Ilonka’s roommate Anya Zimmerman doesn’t bother with herbs, nor does she delude herself that she is going to recover. She has already lost one of her legs to cancer and is living with so much pain the morphine no longer cuts the mustard. Anya’s personality is quite different from Ilonka’s in many ways, but the two girls are still good friends. The love of Ilonka’s life is a fellow patient named Kevin. It seems a doomed love though. Kevin already has a girlfriend and his leukaemia is quite advanced. He’s a good guy who is in a bad way. The other main characters are a young man named Spencer Haywood and a girl named Sandra Cross. Spence has quite an outgoing personality and, all things considered, he’s a fun guy. Sandra is a slightly less interesting character, but that is okay because she does not play such a big part in the story as the others do. Like the others though, Sandra is a member of The Midnight Club. They call it The Midnight Club because midnight is the time they meet. They see each other through the day, of course, but midnight their special time, when they get together and tell each other stories. Doctor White, who runs the hospice, is happy for them to meet like this because it gives them something to look forward to. Doctor White even allows them to meet in his study and always leaves a fire blazing in the hearth. None of them can agree whose idea it was to form the Midnight Club. Spence claims it was his idea, Ilonka thinks it was originally Kevin who thought of it, and he says it was Ilonka’s idea. The origin of the idea is not important. The main thing is that they enjoy getting together and sharing stories. One idea unquestionably belongs to Spence. Because none of them will ever know what happens after death until they have entered that dark and mysterious realm, Spence suggests that the first one of them to die should try and return, and give the others a sign that he or she is still around. You might think that Spence’s idea forms the main storyline of the book, but it doesn’t. There is a lot happening in The Midnight Club, but the touching love story between Ilonka and Kevin is probably the main driving force of the story. There is also an interesting subplot involving Kevin’s girlfriend Kathy, who visits him regularly and has not really grasped the fact that he isn’t going to get better. When Kevin commences telling a particularly long story, that requires three nights to relate, there is always the question of what will happen next in his story and this is another good subplot. Then there is the Master. He turns up in many of Ilonka’s dreams and she believes she knew him in several past lives. Kevin also seems to be familiar with Ilonka’s Master and so—here again—the reader is presented with another little mystery that is added to the mix and provides a little more life to a story that is primarily about death. The Midnight Club is 211 pages long and all the characters are very believable. They have hopes, dreams, and ambitions; just like real people do. The Midnight Club is about life and death and stolen futures, and a whole lot more. It is a sad story, that is a little depressing, but is nevertheless a very enjoyable read. However, it may not appeal to readers who prefer a traditional type of horror story.